Adding anything from a package to nice, fresh juice seems odd. I have found three things that I occasionally use to give juice an extra kick or just to have something a little different. Chia Seeds: Vegan and gluten free, they add fiber, omega fatty acids, antioxidants, protein, and other vitamins and minerals. They may also help in weight loss. 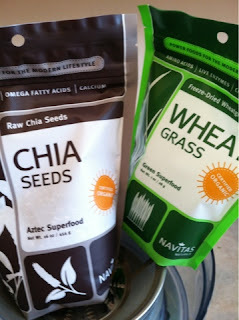 Wheat Grass: alkaline, minerals, vitamins, antioxidants, protein, gluten free and vegan. Pure Green Protein: Packed with protein “with the amino acid ratio of human muscle.” Great for mornings that I feel bad about not having a protein for breakfast or for using the mixed berry flavor to mask an unfortunate juice mix. Watch out! Katie is in the kitchen. My cooking style seems to have landed somewhere between dorm room cuisine and Food Network fan. To eat well during the week, I need to cook on the weekend. Today’s preparations were inspired by fellow bloggers and Dr. Oz. 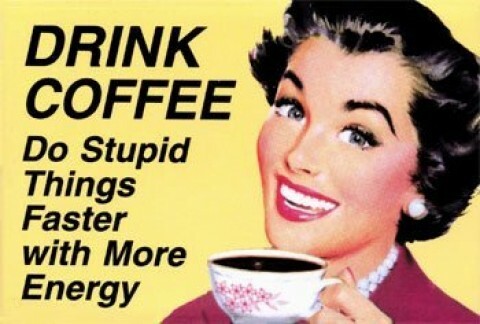 There are plenty of reasons people say that you should not drink coffee at all. It is addictive. It can increase anxiety and stress hormones. It creates an artificial high that leads into a crash. It stains our teeth. It can negatively affect blood sugar levels. Knowing all of that, I still love my joe. It does have antioxidants. It can increase alertness and metabolism, perhaps only short term, but it works. It can help headaches and dilates airways. Maybe that is why it is found in medications. There are studies that found that it may help to prevent some illnesses, such as cancer and type II diabetes. As I described in a previous post, I am usually tired. Even with coffee, I sometimes have to use tools that I learned playing sports to jazz myself up to be productive. Instead doing sprints at the end of practice, I am finishing up paperwork. It was only two and a half days, however, I am so happy to be home with my juicer. I feel kind of silly. I have not been juicing for that long, but I really missed my fresh, organic veg and the juicer. I really tried to eat well while I was away. Not having a refrigerator was very limiting. The local store had some organic juices but they required refrigeration. I survived on nuts, dried fruit, apples, peanut butter, protein bars and an instant rice noodle bowl. A bagel and packaged juice made it into yesterday’s fair. I never really wanted to go out to eat because most of the local restaurants were either expensive or specialized in bar food. I think I’m becoming a food snob. The juice I made this morning was, by far, the best I have made. It starts smooth and sweet with a light pear flavor and finishes with just a suggestion of heat. (I think I watch too many reality cooking shows, hehe). The Mix: 2 colors of Kale; one scallion, parsley, yellow carrots, broccoli, a touch of cauliflower, 1/2 a hot pepper, one each of pear, orange, apple and tomato. The picture shows everything I used. 60 Minutes had an interesting story about sugar as a toxin. Every time I hear the word ‘sensitive’ I think of a high school friend that was getting frustrated with a couple of us teasing her about something. Someone told her “don’t be so sensitive we’re just kidding.” She yelled back at us, teeth gritting: “I’m not sensitive”. While that did stop us from teasing her–about what I don’t remember–we all had a laugh at the ironic delivery of her declaration. I have a few self-diagnosed food sensitivities. No real allergies or Celiac disease or any of the truly horrible things that many people have to live with. I was a soy baby but dairy did make it back into my life. I took lactate pills occasionally in my teen years. I really did not believe that it was a big deal unless I wanted some cafe con leche (warm milk was always worse) or to binge on pizza. Recently, I have been using a coconut based creamer in my coffee and have not had a lot of other dairy products simply as a product of my current diet. I do feel consistently less bloated. This could also be because I have cut way back on gluten. I am not gluten free and hope I never have to be. Just cutting down has been a struggle. Sub sandwiches taste so wonderful but make me feel off for a few days after. I have yet to figure out if it is the bread, the filler in the meat or something else.